Goldilocks & Her Doodle: The Milt Strikes Again! Lately our dood is just out of control. Well, it's not that bad, but in the heat of the moment, it seems pretty darn bad to us. As you all recall, last Tuesday morning when I left for school, the Milt ripped into my mitten. Well, on Friday morning when I left, our doodle went for Daddy's shoes, once again. These were, as were last, a well-heeled pair of Allen Edmond shoes that Jeff bought only within the past year. Thank goodness these shoes are more salvageable. Only one shoe, thankfully, is very scratched up and almost chewed through completely but not quite. A half of a shoelace was torn out, but that is easily fixed. It is good that Daddy caught Milt in the act, otherwise Jeff might be showing up shoeless at work by this point! I am convinced that Milt partakes in these early morning destructive acts because he is upset that I am leaving him to go to work. He simply cannot bear to be without his Momma for the day, and he consoles himself with a quality article of clothing (Milt has good taste) that smells like either Jeff or me. Jeff just thinks we have been poor disciplinarians, and Milt is just about at that age, 10-months, where he will start testing our alpha male and female roles in the household. I kind of buy into that theory too because when Milt misbehaves, I respond to him, like I do my students, with one serious look and a stern utterance of his name; it generally works. Perhaps now I am losing my touch. Who knows? All I know is that Jeff has been far better at forgiving and forgetting than I have. For about a solid day after this incident, I could hardly look at the dog because I feel he has wronged us an undue number of times. Notice that I just called Milton, "the dog." It is a sad, sad day when I start calling my beautiful boy, "the dog." What are we to do? We hate to acknowledge bad behavior with rewards, but that's all we've got right now. That and keeping all shoes out of harm's way! After a late night trip to the pet store, this is what Milt ended up with. We are under the impression that if Milt has enough chewy toys to amuse himself then he will stick to nibbling on his own items rather than our personal items. 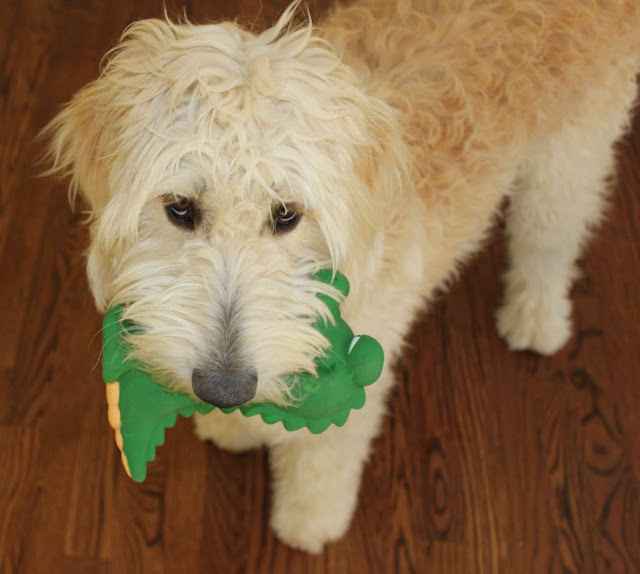 Well boys will be boys, and we might just have to wait for our goldendoodle to grow. Although, I have started to leave the house with a feeling of dread in the pit of my stomach. I certainly hope Milt outgrows this phase and fast. oh no Milton Allen Edmond shoes!! I remember the first time my puppies chewed up some of my very very fancy high heels. I was soo shocked that it happened but then realized how could I honestly be angry at them. I had to start putting all my shoes away in the closet and always keep the door closed. If you have Old English or those wood stain pens you can minimize the raw cuts in the leather. It will minimize the damage. Good idea. I will get them polished, but I need to purchase some new shoelaces. That ten month puppy rebellion stage is killin’ me. My recycling bin is constantly empty because Stan has taken everything out, carried it to the yard and strewn it EVERYWHERE! Whatever Cooper (our much more mature dog) has, Stanlee thinks HE should have so.....he takes it. The cat has turned into a favorite toy and the bird cage is being scoped out for good things to eat that he's not supposed to. So far he has not gotten back onto the kitchen counter BUT the couch has become his favorite hurdle and I do NOT find that funny.......not - one - bit! Okay fine, it’s kinda funny because he gets this look on his face like “HEY MOM!!! Did you SEE that?!?! ♫ How AWESOME!!! ♫"